Ever since the heyday of the Puritans, back in the mid-17th century, Anglican churches have tended to be somewhat spartan affairs, perhaps archi­tec­turally impressive but internally adorned in the sort of austere manner that could have inspired the minim­alist movement. All Saints Church was built with the support of a very different movement: the Ecclesiological Society, which had its origins in a group founded by earnest Cambridge University students who sought to uplift the hearts and souls of their countrymen by encour­aging a return to the glories of medieval church archi­tecture. One of the society’s founders, Alexander Beresford Hope, came from a very wealthy family and it was his money that funded the church’s construction. Except for its soaring spire, the dark red exterior of All Saints is not especially remarkable – indeed it would be difficult for the structure to catch the eye from the street, given the tight space into which it had to be crammed. It was hemmed in by buildings that were tall for the time, prompting the archi­tec­tural historian John Summerson to call it “a saint in fetters.” Step inside, however, and you’ll encounter one of the most breath­taking sights in London, if not in all England. Built in the 1850s in Gothic Revival style by the scrupulous (and appar­ently tyran­nical) London-born architect William Butterfield, All Saints is High Church at its highest. Its walls, floors, windows, ceilings and every nook and cranny are all suffused with extraordin­arily ornate detail. Influenced by by the brick churches of Italy, north Germany and East Anglia – and by John Ruskin’s essay of 1849, The Seven Lamps of Architecture – the polychrome brickwork, combined with elaborate stonework, gilding and tiling, can scarcely be matched by another church of such compact propor­tions anywhere in the British Isles. Describing the interior as “a riot of colour,” John Betjeman said “there’d never been anything like it.” The church’s original furnishings were relat­ively simple – its beauty was intended to reside in its fabric – but these were augmented during the early 20th century and the focal parts are now enriched with paintings, statues and silverware. A recent renov­ation programme has restored the brilliance of both the fabric and the ornament­ation. 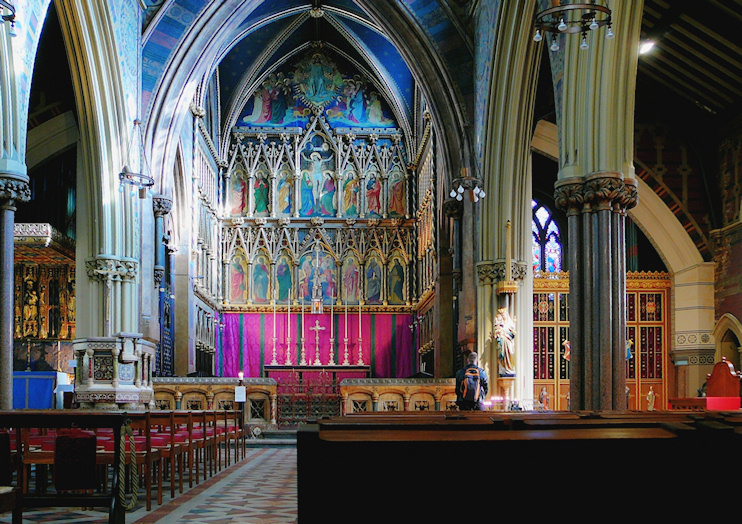 All Saints functions within the Anglo-Catholic tradition of the Church of England, holding a high mass on Sunday morning and low masses, prayer services and confes­sions throughout the week.